It looks sort of grayish in the picture because I added black olives before I thought about how unappetizing that might make it look in the photo! Honestly this tastes so good that my husband has wondered why everyone doesn't make hummus with lima beans. This would work fine with other white beans that we're allowed on GAPS, but as they are higher in oxalates I decided to go with limas. Put all ingredients in the blender or food processor and blend to desired consistency. Taste and adjust flavors. You will undoubtedly find your own blend of ingredients that you like best. For variation, try adding olives, anchovies, roasted garlic, roasted peppers, dried tomato, or whatever herbs and spices you like. If you find an especially tasty variation, please post it in the comments for us all to enjoy! 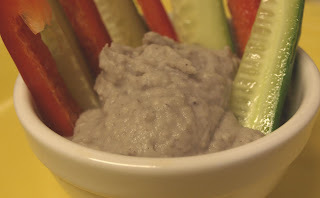 If you serve the hummus with sliced veggies for dipping it makes a nice side dish or even a light meal. How creative! Hmmm, this may be a way to get me and my family to eat lima beans! I forgot to put in the recipe that to make this like hummus, you can add tahini. I didn't add it because it is very high in oxalates which is an issue for one of my kids, but not an issue for everyone. My son has sky high antibodies to sesame, so if he will eat this I won't be adding the tahini either. I made this with navy beans instead of lima. It is delicious! My husband added some green olives to it and, oh...YUMMY! Can't wait to eat this tomorrow w/ fresh veggies. I LOVE all the great recipes on here.